Ilina here today taking over the My Sweet Petunia blog. 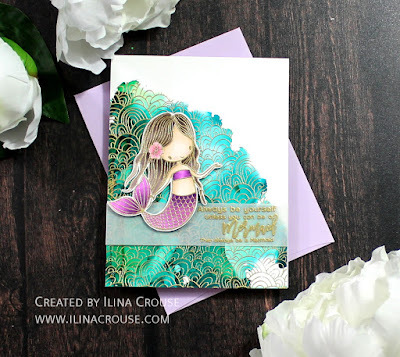 Today I am sharing a card using some Picket Fence Studios goodies. I am using the I am a Mermaid set along with the Ocean Dreams background stamp. I started with a pre-made alcohol ink background on Yupo paper. 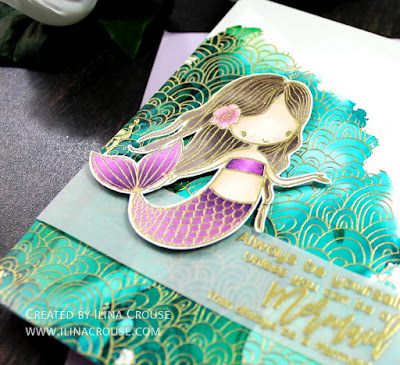 I masked the edges where the white space was and stamped the background using my MISTI, once stamped I applied gold embossing powder, removed the particles from around the creases of the background and heat set it. Stamped the image in Versamark and embossed in gold, then colored and trimmed it. Stamped the sentiment on Vellum, and again embossed in gold, then trimmed to size and added on my card. I assembled my card onto white top folding note card. Watch the video below to see how this card came to be!